Yeah, it’s rainy here. I’m not sure it’s at deluge level yet, but it certainly is raining pretty hard. And steadily. Check the 365 photo for an image. The good news is that the gutters seem to be working much, much better now that they are cleaned out. I know, shocking, right? I can’t remember ever hearing that much water pouring through the downspouts. But this is a good thing. I’d rather have the water going down the spouts than pouring off the roof, that’s a certainty. But today is a holiday, and the kids are home but RM Husband is at work, so I’m stuck in the house with the 3 year old and 6 year old. Thankfully, I’d been stockpiling activities for just such an occasion. And I found one recently that completely took my back to my childhood. Seriously, these things are still around! I found them at Michaels. They seem a little less– quality?– than before, which I suppose is saying something significant because it’s not like Shrinky Dinks were the height of craftsmanship in my childhood. But these worked fine, and now with all the advancements in Shrinky Dink technology, the instructions tell you to use the toaster oven instead of the regular oven. But do NOT try to use the microwave, folks, they are very emphatic about that. 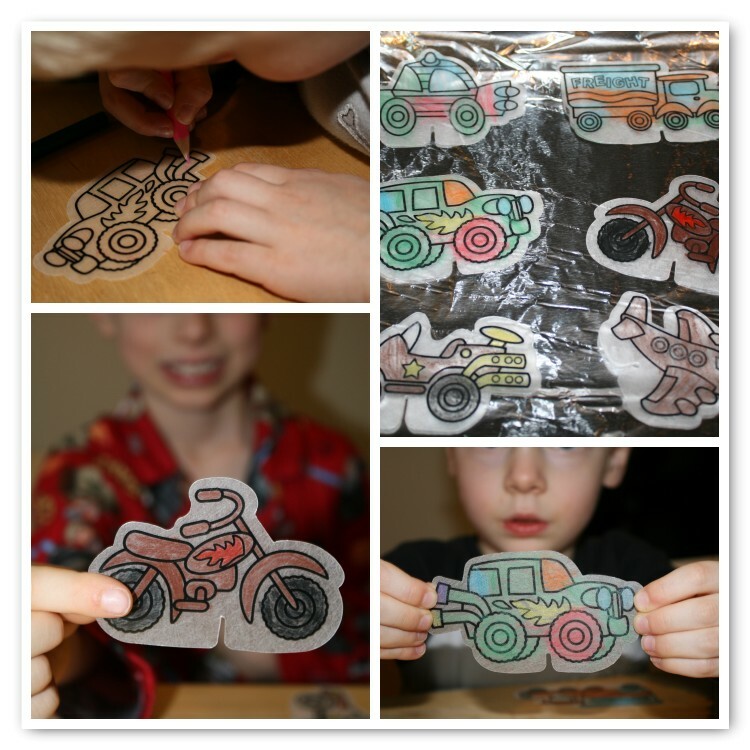 After coloring, you put them on some foil on a baking sheet and lay them out, and then you stick them in the toaster oven. Each boy did three. Yep, we did it in our PJs. Isn't that what school holidays are for? And then they shrunk! This video isn’t the greatest, but it’s kind of cool. Listen to the delight of the children! Here’s how they turned out up close. So much tinier! So it was a nice little 30 minute activity for a rainy day. 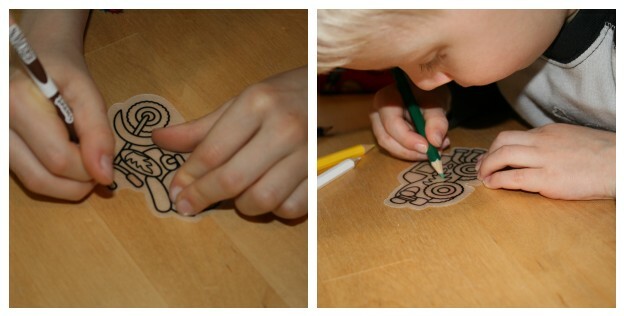 I hope you can get you some shrinky dink fun sometime soon! Holy Mackrel! I know they’re still around but I’m always happy to see the fun they inspire. They remind me I need a new key chain. 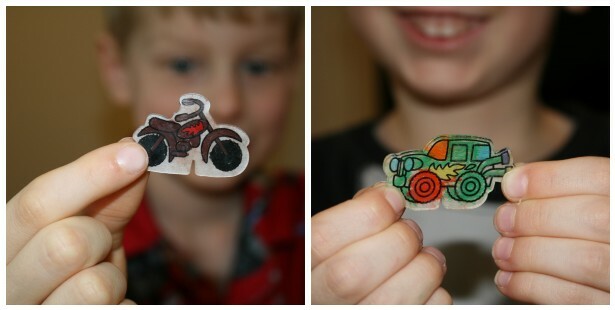 Love Shrinky Dinks! What are those notches in the bottom? Are you supposed to attach these to cups or display stands or something? I remember cutting a small hole at the top of mine with a protractor so I could turn my magical creations into ornaments and jewelry, but that notch ting is intriguing. Yet another in a long line of Shrinky Dink “improvements.” The set came with these little holders, which really are just cardboard with a matching notch in it, so you put the notches together and you get an X shape that allows the Dink to stand. Totally unnecessary, in my book, but the kids did use them to “drive” their cars.